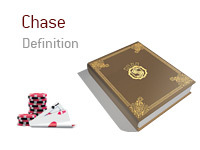 What does the term "chase" mean in the world of poker? What is meant by the word "chase"? In poker, "chasing" in a hand means that you are very likely behind your opponent (an "underdog") and are looking to hit a card that will put you into the lead. You are playing in a cash game at your local casino. 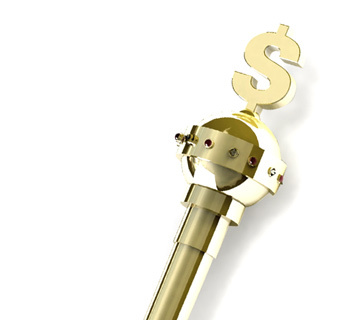 A passive-tight player raises from early position, which means that he almost certainly has a monster (KK or AA). Action folds around to you on the button. You look down at 6d-7d and decide to call. The SB and BB both fold. The flop comes Ah-4d-Kd. You have a small flush draw and not much else, and there is a great chance that your opponent has just flopped a set. Your opponent leads out with a big bet, and you decide to call, even though you are almost certainly behind in the hand. The turn brings the Qh. Given that your opponent almost certainly has a big pair, there is an even greater chance that he has a set now. Your opponent leads out with a pot-sized bet. You do not have the odds to call, and you are almost certainly behind in the hand. If you call, you are "chasing" your flush even though you are not getting the proper odds. Even if you hit your flush, there is a small chance that your opponent will have a better flush (maybe he has something like Ad-Qd). You decide that you don't want to "chase" your flush and fold the hand. Your opponent triumphantly flips over pocket Aces. Note: a common mistake made by new players is "chasing" hands. You have to know when the odds dictate you staying in the hand, and when they dictate throwing away your hand.